I recently read an inspiring article about a man who gets up everyday at 4:22am. Not 4:15. Not 4:30. He generously took readers through each moment of his day from the minutes he eats breakfast to what he reads on his commute to work. He sounded fulfilled, satisfied and very very productive. I hate that in people. Actually I love it. I was intrigued and also a little jealous of this dude’s tenacious way of being each day. He accomplished much and took very good care of himself: eating crazy delicious food, working out at crazy CrossFit, rearranging his crazy routine so he could invest time in his marriage. So I decided to take some notes from his perfect life (just kidding, he doesn’t have a perfect life…in fact he says he sticks to his 4:22am routine about 90% of the time [so he’s kind of a failure]) and get into a routine that would work for me…but then I realized something. I have a pretty good routine myself. I look at my intentions for the day for work and health and creativity and love and then I set my alarm. I often do a 30-minute stint. For instance, this very blog post (which is a looooong time in coming) I decided to set aside 30 minutes to get it together. During this time my dear husband has texted me (but I won’t respond until my 30 minutes is up…sorry Love…we’ll chat about this Caspian Sky very soon). I also got a pop-up that an email came in from my writing group friend which I’d typically answer immediately, but, Kelsey, it will have to wait. So set your alarms. Just do it. Just try it for a day. I know some people have babies that are attached to bodies or financial issues that loom large or bosses that push buttons but protect yourself with a little timer that sets some limits. Start small. 5 minutes to check email? 10 minutes to read up on the latest [insert whatever you’re interested in: techie hacks, bouldering videos, recipes with saffron, candle making, style watching, etc.]. These little alarms I set give me opportunity to make short term goals; small things that reap big benefits. It makes me not only accomplished but I get that feeling of scaling a summit…of reaching the top…of being a superhero! Okay, maybe that’s a stretch, but it sure does help to get stuff out of my brain and through my fingers so I can make space for other small goals. So those are daytime goals…everyone has those in small ways: milk the cows before sunrise, get the kids to school at a certain time, make a lunch date, bake the souffle for this long, organize, schedule, commit. But that early morning wake up? Holy! All I can imagine is waking at 4:22am and immediately feeling sick until I slam back to sleep. I remember back in the crazy brain days when I used to book airline tickets with ridiculously early takeoff times that would require me to leave my house at the ungodly hours of 3:45am or 4:04am just to save $80. Aside from the fact that I usually sleep restlessly the night before a trip because I’m ticking off things I’ve forgotten to pack or I’m worried I won’t hear my alarm and then I’m worried about missing my flight until the 20 minutes before my alarm goes off when I’ve fallen into the World’s Most Deliciously Deep Sleep of the Dead…early mornings are just sickening. That early morning flight craziness which made me feel instantly ill and like I was dragging my knuckles on the floor and moving through molasses taught me something: I’d pay $80 to get a good night sleep and travel without feeling like an infected ape. I had to give up my expertise about not finishing my novel and do that superman trick of REVERSING THE ROTATION OF THE EARTH to get my characters on the page. Sometimes you need a grand act like that. Who am I kidding (besides everyone)? Ugh. Those never work. They’re like resolutions that haunt you. I made a resolution once that I’d floss EVERYDAY because I learned that the health of our teeth is the gateway to full body health. C’mon people, who is flossing every single day? People we can’t be friends with, that’s who, because obviously those people must be Jesus the Christ or something and probably JC wasn’t real concerned about his dental health. Am I right? ANYWAY (travel? flossing? what is happening!?). After my Novel Marathon I was totally sleeping in until 7:45 or even 8:00 (though my husband might say it was sometimes as late as 8:30 which is considered a cardinal sin in this household). Make Small Goals…Goalies–for just one month, or just 16 weeks or just 1 week. Set Your Alarm–change up your routine. 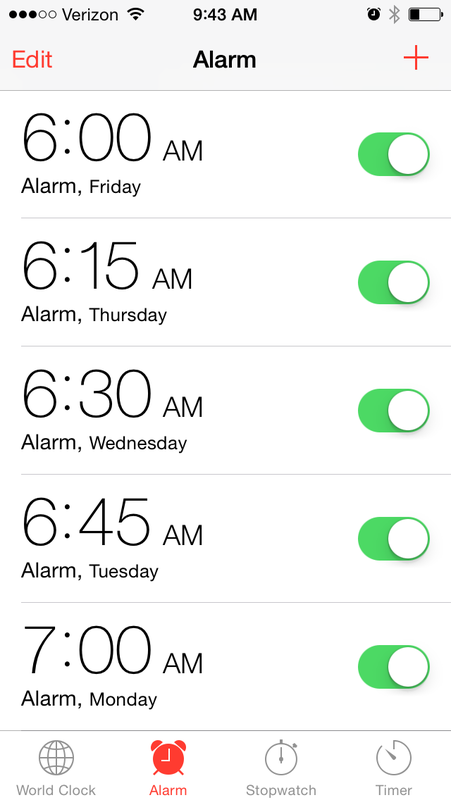 Here’s a screenshot of my alarms for this week. I’m waking up 15 minutes earlier each day to try and get a handle on an earlier wake time so when that alarm goes off I don’t feel disgusting and disheveled and like something crawled in my mouth and died in my throat during the night. Share Your Awesomeness With the World–I told my family about my new attempt at harnessing the morning hours over dinner the other night. I’m pretty sure they were ignoring me or trying not to let me see them roll their eyes at my latest proclamation. But, hey, I’ve got to start somewhere, right? Now, go. Set your alarm for 10 minutes and do something different…I dare you.